One would be hard pressed to say that they have never caught at least a glimpse of the historic estate with the flavor of an Italian villa in one of the many Hollywood productions that were shot here. Appearing in music videos, movies, TV series and serving as location for the production of music albums from famous artists such as Gwen Stefani, Red Hot Chili Peppers and Elton John, among many others, Canfield-Moreno Estate is an important highlight of Silver Lake real estate landscape. The 22,000 square foot mansion was erected in 1923, for Antonio Moreno, a silent movie star, and his wife, Daisy Canfield-Danziger, daughter of an oil pioneer. Although the marriage between the two did not last very long, as they divorced in 1928, the mansion has stood as a symbol of glamorous old Hollywood for almost 90 years. A place where Hollywood parties were the norm, the mansion was to receive a scary reputation, after the oil heiress and owner of Canfield-Moreno Estate, died in a tragic car accident on Mulholland Drive, in 1933, when her car sent her off a high cliff. Rumor has it that her ghost is still wandering on the halls of the estate, and it comes as no surprise that many horror movies have been shot here. For a long time, Canfield-Moreno estate was not part of the Los Angeles real estate market per se, as the building served other purposes. In 1950, the estate was turned into a Franciscan convent where the nuns later ran a school for troubled girls. For a long time, the beautiful estate was left prey to decay, and it was only in 1998 that the property was finally purchased by Dana Hollister, a developer that decided to restore the place to its former glory. The purchasing price was $2.25 million dollars, and the developer wanted to transform it into a luxury hotel. However, because of opposition by some neighbors, this project was forgotten and Canfield-Moreno estate remained a private residence. 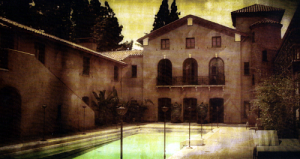 The owner seldom rents the estate for Hollywood movies and TV series, and its reputation as a Los Angeles Historic-Cultural Monument recommends it for many artistic activities. Despite the well-known fame of The Paramour Mansion, or The Crestmount as the property is also known as, of being a haunted place, it exudes great fascination and many celebrities covet spending at least one night under the roof of Canfield-Moreno estate. Such properties make for great highlights of Los Angeles real estate market, but they are not the only ones in the neighborhood. There are plenty of other properties benefiting from their proximity to these historic symbols. Give us a call today at 213 375 8738, and we will get you the best quotes in the Silver Lake area, regardless of whether you want to rent, sell or buy properties in Los Angeles.